Cyclone Haruna hit the southwest coast of Madagascar on 22 February. The very next day, the International Charter on Space and Major Disasters, currently chaired by France, was activated to come to the aid of the 20,000 people left homeless in its wake. 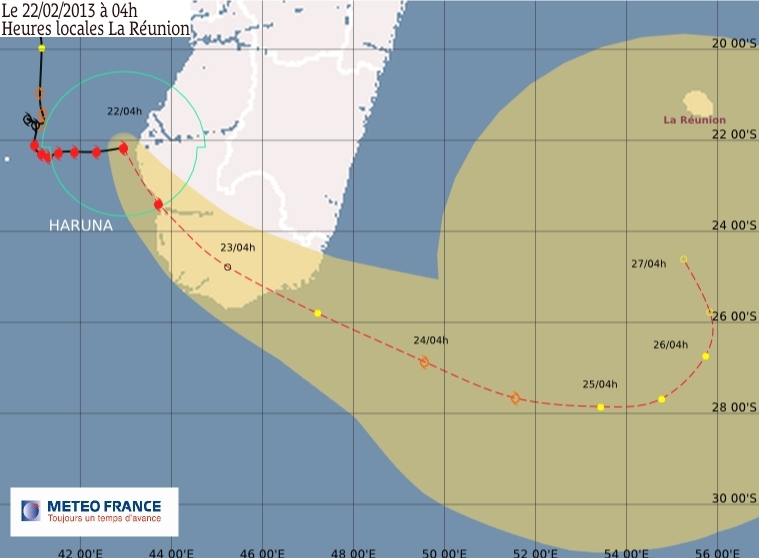 Forecast track of Cyclone Haruna on 22 February, from the south of Madagascar to Réunion. Credits: Meteo France. On 22 February at 6:00 a.m. local time, tropical Cyclone Haruna tore into the southwest coast of Madagascar, leaving a trail of destruction with strong winds and flooding. Figures released by BNGRC, Madagascar’s national emergency management agency, indicated the cyclone claimed more than 20 lives and left more than 20,000 homeless. The International Charter on Space and Major Disasters, which France is chairing until mid-April, was activated by the French interministerial crisis management unit (COGIC)in Paris on 23 February to help organize relief efforts. The charter’s 14 member agencies, including CNES, urgently tasked their satellites to acquire data for the SERTIT rapid mapping unit in Strasbourg to generate disaster maps to be dispatched to emergency response teams on site. Eight such maps were produced and delivered to BNGRC. These maps helped relief teams to identify immediate priorities, complementing reconnaissance work on the ground. Map of the town of Toliara, southern Madagascar, produced on 27 February by SERTIT. Credits: SERTIT 2013. Data from CNES’s SPOT 5 and Pleiades satellites served to produce several maps. The map of Toliara in southern Madagascar, for example, clearly highlights destroyed and flooded buildings. It is also possible to distinguish main and secondary roads, useful information for guiding first responder teams. Infrastructures such as the hospital, gymnasium, dispensary and police station are also indicated as potential assembly points for populations… Another map of the Sakahara region shows buildings damaged by the floodwaters and winds, flooded croplands and spontaneous gatherings of people. 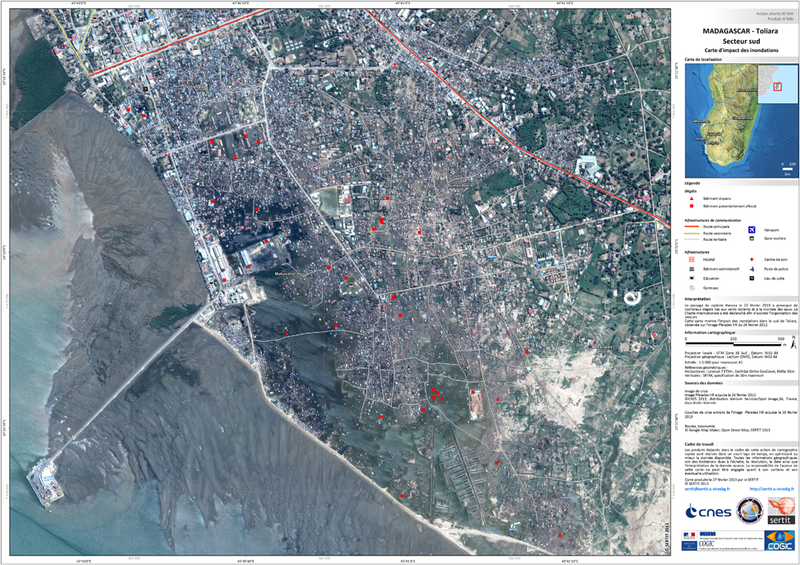 Post-disaster images were compared with archive imagery and BNGRC and charter teams remained in constant touch as the disaster unfolded to define satellite imagery requirements. The 434th mission of the International Charter on Space and Major Disasters came to an end on 1 March, 6 days after it was activated. The satellites resumed routine operations while relief teams pursued their efforts.